Why the Credit Union Marketing University (CUMU)? Credit union marketing budgets are squeezed due to increasing operational, regulatory and technology costs. CEOs and CFOs are expecting and even demanding more bottom line results for marketing dollars spent. To understand the complex, competitive marketplace and how to respond with effective marketing takes more than having a marketing degree, on-the-job training and/or experience at the credit union. Since training costs have also decreased, the original full-week Credit Union Marketing University (CUMU) program has been retooled for more cost effectiveness. The new program offers webinars, coaching calls, informational handouts and samples, worksheets and one-one-one advice. Now, credit union managers, C-Staff and the marketing team can learn how to make strategic decisions for the best marketing solutions. They will be taught to consider the financial impact and calculate bottom-line results. CUMU bridges the gap between existing skills and the expertise needed to meet the demands of the current marketplace for your credit union's success. Who has attended the CUMU? Marketing professionals, senior managers, and CEOs from credit unions of asset sizes from $22 million to $905 million. Any credit union executive who is responsible for the development or implementation of marketing at the credit union will gain from the curriculum of the CU Marketing University. 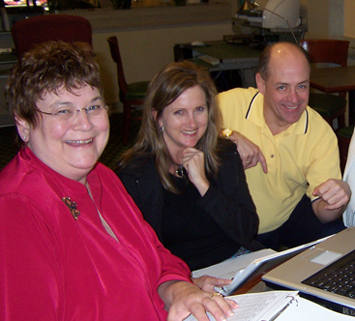 The experience of our faculty enables the discussion to be tailored for every size. "Because of the complete analysis that the class learned about, including learning the 'critical thinking process' in regards to presenting out marketing initiatives to our senior management team." "Leaving with the knowledge and tools to make better sense of the bottom line, and develop a clear marketing plan that is in sync with the Credit Union's strategic plan." "I learned things that I'd never been taught." "Nicki is so knowledgeable and a great instructor. The CD is also a great tool to take home. The CEO piece was helpful and a great resource. Their point of view was great if you don't have a chance to get that from your CEO"
"It allows marketing folks to learn techniques and strategies and the skills to understand the bottom line,"
"Learning how to calculate ROI. Also, the templates for Cost Recovery & Timelines, etc�very valuable!!!" "It takes you through the entire marketing process from strategic planning to ROI, to a complete promotion project,"
"Learning ROI and planning strategy,"
"It's a tool to increase your value to the Credit Union. CUMU could be the start of a more professional, focused career path,"